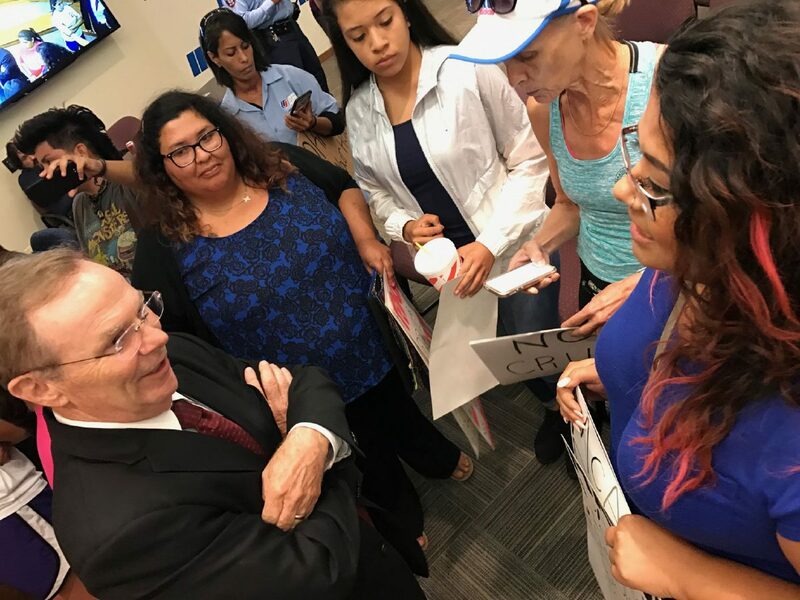 Mayor Jim Darling meets with protestors before heading into executive session at the McAllen City Commission meeting on June 26, 2017. Editor’s note: This story is updated to reflect that LUPE will not meet with Sen. Ted Cruz, as Mayor Jim Darling originally said. McALLEN — Hours after Mayor Jim Darling released a statement that Sen. Ted Cruz asked to be part of McAllen’s Fourth of July parade, Darling stressed the importance of Cruz’s visit in front of a handful of protesters at Monday’s city commission meeting. Darling has received some local criticism recently for having Cruz participate in the parade, so Darling put out a statement Monday afternoon and had an item on the meeting agenda to address the parade. “I want to thank everybody for being here today,” Darling said toward the end of Monday’s meeting. “The Fourth of July is obviously an important day and we, like most cities, have festivities on it. one thing that came up, and want to talk about it because I don’t talk to the other city commissioners very much outside the meetings, is to let you know that we did have Sen. Cruz’s office contact me and ask to participate in the parade. And as a U.S. Senator from our state, we certainly don’t want to tell him that he can’t. 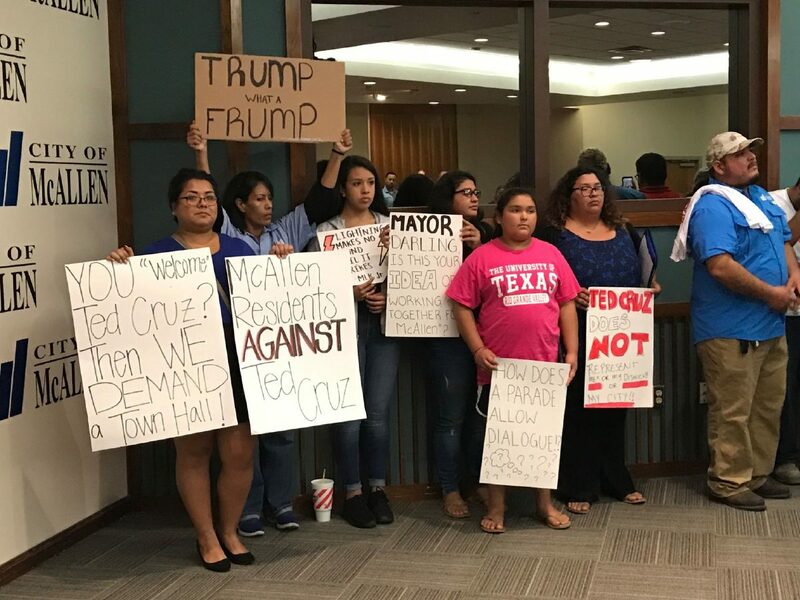 Protestors stand in opposition to Texas Republican Senator Ted Cruz's upcoming Fourth of July visit at McAllen City Hall during the June 26, 2017 City Commission meeting. However, LUPE Executive Director Juanita Valdez-Cox said Monday night that the group will not meet with Cruz. LUPE was contacted by Cruz’s staff, but it will not accept the invitation to meet with the Senator. District 2 Commissioner Joaquin “J.J.” Zamora said he’s heard from concerned constituents about Cruz’s visit, and emphasized that Cruz inquired about participating in the McAllen parade. Cruz will not be leading the parade, Darling said. He will be riding in a vehicle in the parade, as will McAllen’s Democratic Congressman Vicente Gonzalez. State Sen. Juan “Chuy” Hinojosa will be the parade’s Grand Marshal. Protesters at Monday’s meeting said Cruz’s interests are completely different to those of the Valley, such as the building of a border wall and the welcoming of immigrants. This will mark Cruz’s second visit of 2017. He was in Mission in February for a border roundtable conversation with local officials before taking a tour on the Rio Grande. Cruz will likely be giving remarks at Archer Park the day of the Fourth of July parade. He will then participate in the annual brunch afterwards, which will be put on by the Chamber of Commerce. Darling said he asked Cruz’s staff if they would meet with LUPE, and Cruz’s staff then invited LUPE to meet. But Valdez-Cox said the group is declining. Protesters at Monday’s meeting hoped more groups would be invited to meet with Cruz. They also did not want to simply be a photo opportunity for Cruz as he launches into his 2018 re-election. Darling met with protesters before the commission entered executive session, fielding their questions. Salas said she was pleased with the mayor’s handling of this. She said she campaigned for Darling during his recent re-election this spring.